DevPro’s versioning allows school and group administrators to have control over when and if they upgrade their curriculum. We consider our software updates to be one of the most important features of DevPro. But we are also very sensitive to the need for schools, teachers, and administrators to be in control of the curriculum they use to match schedules and lesson plans. Because of this, our major updates will happen in the summer, between school years. That said, we still recommend classes use the latest version as soon as you start new classes. This will grant you the latest game engine tools and updated curriculum. By default, your organization is Version Locked at whatever version you first received when you registered. The earliest versions of the course (up to the end of 2014) had numbers but starting in 2015 each Version is labeled by the month it was released: January 2015, February 2015, etc. The latest update was September 2015. If your account is NOT set to Automatic Updates, you and your students WILL NOT automatically receive any updates until an administrator for your organization makes a change to your Version Lock. 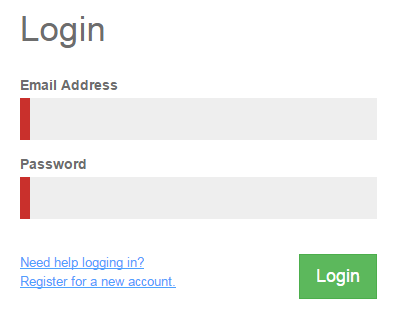 Log in to your GG|Interactive account. Step 2: Go to your Products page. 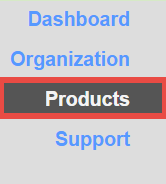 From your Dashboard, move to the Products page. Step 3: Find “Version Updates” Link. 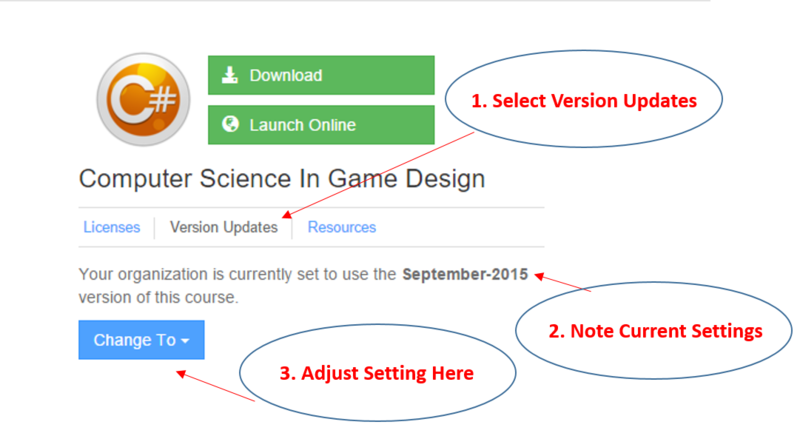 Under the curriculum heading (either Game Design or Game Programming), you will see a “Version Updates” button. Click this link to open the “Change To” tab. Below Updates you will see a note informing you of the version you are currently using. To change the version, Click “Change To”. Step 4: Choose your version. From the drop down menu select the Version of the curriculum you want, the most recent version is just below the “Automatic Updates” option. Once you have selected your version the box will close, you have now updated your version. *Special note: If you are currently set at a version older than July-2015 and you select a version of July-2015 or newer, you will lose our old “3 Step Studio” tool and gain the new “Game Stack” tool which is based on, Scratch from MIT open source game design tool. We feel Game Stack is a better more effective and relevant tool; however, your download time will be significant when making this change. Please keep this in mind when doing your update. Once you click the version you want, your choice will be locked until you change it. You can change the Version Lock to any specific released version and the next time any one of your students or teachers launches their course the course launcher will automatically download and install the update. 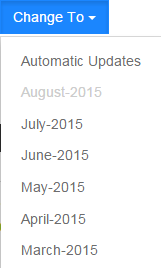 If you want to automatically receive every update you can set your Version Lock to “Automatic Updates”. As always if you have any questions you can Contact Us, post on our Q and A page or post on our Forums. Exactly what is the most effective approach to finish your thesis/research paper?